ONE OF THE "ROOFS OF THE WORLD", LOCATED IN CENTRAL ASIA, COVERING LARGE PARTS OF TAJIKISTAN, UZBEKISTAN, AFGHANISTAN AND CHINA. Pamir Mountains are located in central Asia. They lie mostly in the Gorno-Badakhshan province of Tajikistan. To the north they join the Tian Shan Mountains along the Alay Valley of Kyrgyzstan. This mountain range is very diverse, and attracts different kind of mountaineers and trekkers, since they can always find something interesting there. Aksu and some other rocky peaks are considered a test equal to, for example, Trango Towers and Pik Karla Marksa, Pik Tajikistan and Pik Engels in the Shakdhara Range, which have some of the hardest mixed routes you can find. Pleasant trekking and scrambling can be found all over the Pamirs. The peaks gained attraction after the stabilization of the political situation in central Asia and because of the lack of high permit fees (100 $US at most). The Pamirs are also well known and referred to as the "knot" or axis, since other mountain ranges extend from them: the Pamiro Alai and Fan Mountains to the west, the Tien Shan to the north-east, the and Kunlun Shan to the east, the Karakoram to the south-east, and the Hindukush to the south. The story with the names of the peaks is a bit complicated. The new regimes have gotten rid of many "communist related" names for cities, areas and mountains are no exception. Some peaks have multiple names and no one is really sure what the official names are. 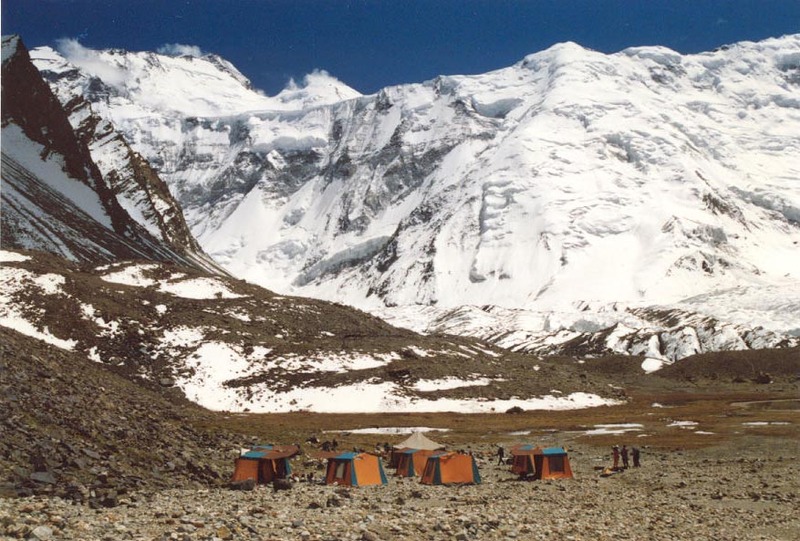 The only peak that has seen some general approval is Ismoil Somoni, which is the new proposed name for Pik Kommunizma. As for the other peaks, they are well known by their old communist names. Pik Kommunizma (Ismoil Somoni) 7495m (24589.9 ft) - Tajikistan. Pik Lenin 7134m (23405.51 ft) - Tajikistan/Kyrgyzstan. Pik Korzhenevskoj 7105m (23310.37 ft) - Tajikistan. Pik Revolution 6974m (22880.58 ft) or 6940m (22769.03 ft) (depending on the map) - Tajikistan. Pik Russia 6882m (22578.74 ft) - Tajikistan. Pik 26 Bakinskikh Kommisarov 6842m (22447.51 ft) - Tajikistan. How to get to the peaks? This is an interesting question since Pamir is in most part inaccessible - due to deep valleys and steep mountains, glaciers, uninhabited areas and the lack of infrastructure. There are exceptions like Pik Kommunizma, Pik Korzhenevskaya and Pik Lenin. The former two can be reached by helicopter, as the hike up is very long and complicated, especially to Pik Korzhenevskoj. As for Pik Lenin's north (Kyrgyz), you can easily get there with 4WD. The south/Tajik side is very remote, generally harder and seldom climbed. The most complicated peaks to reach are the ones in interior Tajikistan. The access situation became worse after the breakdown of the USSR, which also left many former base camps abandoned. One of the important things to mention is that the Pamir has very long, cold and agonizing winters (it also has one of the longest glaciers outside the polar regions), and short, cool summers. So with this in mind, the best time to go climbing is late June to mid-September, and peak season is in the end of July to mid-August. Going in the beginning of this period is not recommended since you would have a lot of snow, it can get colder by the day and you may have the misfortune of experiencing one of its fall storms. Expect to bring all the gear you would bring for an 8000 meter peak or the polar areas. In the off season there are no facilities at the base camps and the passes on the roads can be blocked by snow, so you may have a hard time just reaching the peak. Also important thing to note is that when you start going up the air gets thinner very quickly so even the easiest tasks become an effort. Pamir Highway is one of the most daring mountain roads in the world, so it is recommended that you go by car! One of the best spots to start trekking is Bulunkul, and from there you can go to Peninsula West of Sumantash (about 18km of walking). Along the way you’ll pass the remains of an ancient caravanserai, the Mahjura hot springs, and pre-historic stone circles near the mouth of the Marjanay River. Trekking here can be a real treat for everyone. One of the biggest treats for hikers is Zarojkul (it takes around 5 or 6 days from Bulunkul to get there), and see the what is arguably the most beautiful mountain lake in the Pamirs, fringed by the snow-capped mountain giants. The trails in Pamir are very long (usually 14-20 km) so it’s recommended that you bring a lot of water. There are quite a few camps with all the facilities you will need and in those camps you can rent a place in two person tents, eat food in the tent restaurants, buy provisions and rent guides.